A must see in San Francisco! One of the most popular things do in the city! I’m sure many people have seen this street in a movie or TV show which adds to it’s popularity. It’s both unusual to drive down and a lot of fun. There’s always a ton of tourists and traffic around. Famous for its steepness with eight hairpin turns and for some reason we chose to walk up the thing or should i say climb? Well you do get a slight sense of achievement when you finally reach the top and gather your breath, jeez thats steep! I would suggest it’s a better idea to walk down though, unless you’re up for the challenge. You do get to see some of San Francisco’s most expensive real estate of Victorian mansions lining either side of the street. If you do have a car then you can’t miss the chance of driving down. It’s one way, so you have to start from the top. You may only be going 5-10mph, but it’s still a fun little drive. People at the bottom of the street crowd the intersection for photo opportunities and the traffic in general around Lombard is impatient and doesn’t always obey rules. If your a tourist or resident, you should definitely check this place out at least once. The famous one-block section, claimed as “the most crooked street in the world”, is located along the eastern segment in the Russian Hill neighborhood. The street was named after Lombard Street in Philadelphia by San Francisco surveyor Jasper O’Farrell. 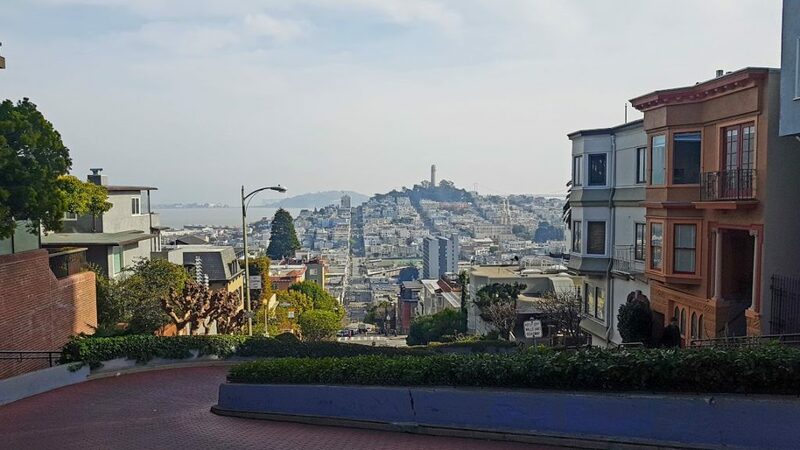 Although it is known as the “Crookedest Street in the World,” Lombard Street is not even the “crookedest” street in San Francisco. That title technically belongs to Vermont Street between 20th and 22nd streets on Potrero Hill. It may look treacherous but Lombard Street’s switchbacks were actually built to increase the safety of the street. The natural steep grade of Potrero Hill was thought to be too dangerous. In the 1920s a property owner suggested creating a series of switchbacks which not only added to the street’s scenic appeal but made it safer for pedestrians. It has eight hairpin turns, If you walk up the left side, there’s 253 steps, and 249 steps on the right. Boudin Bakery at Fisherman’s Wharf, they do the most amazing clam chowder in a bread bowl. Visiting doesn’t take a lot of time. Depending on your fitness level you can walk from the bottom to the top in less than 5 minutes. The leisurely way to enjoy it though, would be to start at the top and then walk down admiring the mansions as you go. 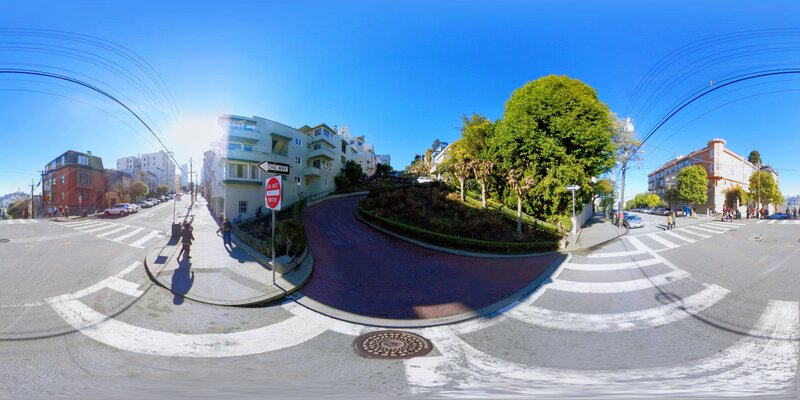 The crooked famous portion of Lombard Street is located between Jones St. and Hyde St. An exact address to reach the crooked street from your GPS or phone is 1070 Lombard Street, San Francisco, California 94109. Bus. You can take several city buses through North Beach to get here, the most popular of which is the 30, which runs from Union Square. You should get off on Columbus near Lombard. From here you will walk west (uphill) a few blocks to get to Jones, the bottom of the hill where the curvy part of the street begins. Cable car. The Powell-Mason cable car line stops at Lombard and Columbus, too, so that’s an option for getting to the bottom of the curvy street. Alternatively, the Hyde Street cable car will drop you off at the top of the curvy street. Car. Note that the curvy portion of the street only runs one way, towards the East. To drive you’ll want to come to this street from Van Ness, turning east on Lombard and taking the road this way. Uber Get $5 (£3) credit for your first ride here. If you plan on walking, definitely start at the top and walk down your legs will thank you. Take a jacket with you. It may be sunny in the morning, but the weather changes fast and frequently. The weather in San Francisco is unpredictable and liable to change unexpectedly, so be prepared. Morning and evening fog rolls in during the summer and winter months, but usually burns off by midday. 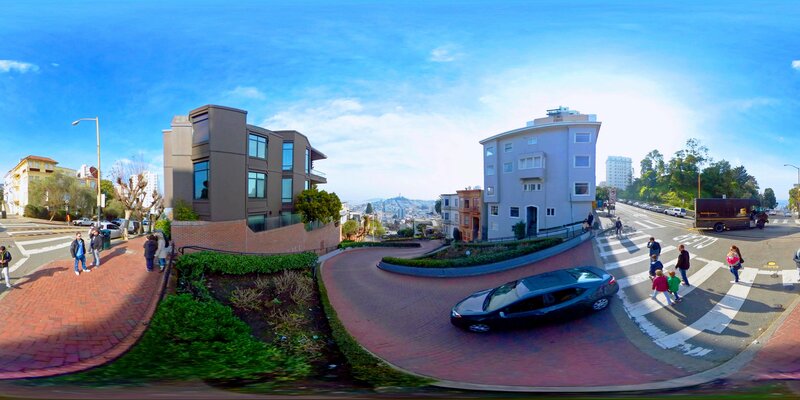 Have you been to Lombard Street? Did you walk up?